Last week, in Magic in DarkDale (Part 1), we introduced how magic spells would be learnt and cast, and how spells were divided in five magic schools (Elemental, Mind, Nature, Light & Dark magic) and two tiers (Low & High magic). 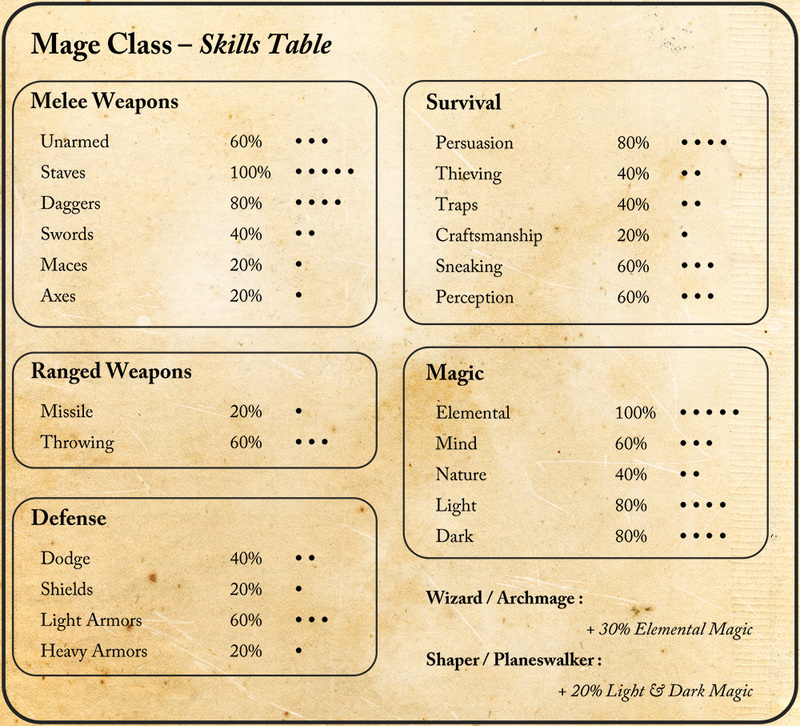 Let’s take a quick look today at what magic-user classes will be able to wield those magic spells. If you haven’t already, please take a look first at the Classes in DarkDale post which discusses the classes system, and Skills and Combat which details skills a bit futher. In a nutshell, remember than all classes can learn all skills, but are not equally good at learning them. How fast a class can learn a skill is determined by the skill modifier, by which invested skill points are multiplied to get the actual skill of the character. So in the tables below, percentages do not indicate how good a character is at doing something, but how good he is at learning it. A Mage may have a 100% Staves skill modifier, but that’s only a potential: if no skill points are ever invested in the Staves skill, that mage will be clueless about what exactly to do with that piece of wood. It works the other way around too: a 40% Nature Magic skill modifier doesn’t mean a Mage can’t be good with nature magic. It just means that a Mage will need to invest two times and half the amount of skill points in the skill to get the same result as a Druid, but he can do it if the player wishes so. At last, don’t forget all those numbers are still in the design phase – development will change them for sure (you can already see that a number of skills changed since the previous posts on the subject). Also, the discussion forums are now open, if you wish to participate in the discussion around the game development. In designing the mage class, I tried to steer away from the traditional D&D division between offensive spellcasters (Wizard) and defensive spellcasters (Cleric). Giving the character easy access to both Elemental/Dark Magic (the most offensive schools) and Light magic allowed for more polyvalent builds, and more choices about how exactly to distribute those precious skill points (although the Mage is still the most aggressive magic-user class). Does that mean that you can just have a Mage and go around happily alternating fireballs and healing spells without drawbacks? Obviously no. In exchange for that magical flexibility, the Mage has little learning potential in all other skill categories, save for Staves and Persuasion, while the Brother and Druid classes can better hold their own if mana runs out. Also, while the Mage can readily access low healing spells of the Light Magic school, he probably won’t have access to the best high magic healing ones, which will bridge the Mind & Light Magic schools. The Brother is a member of the Order of the Two Moons, the main organized religion (see The World of DarkDale). Although technically it is a “cleric” class, by the more general definition of that term, I stayed clear of the word as it now has too many implications due to the way clerics were used in other games, and this class does not exactly fit the archetype. Magically, Brothers (or Sisters) are equally predisposed to learning Mind Magic and Light Magic, skills they can further develop with the Visionary & Master Seer specializations. They are also the only magic-oriented class which can readily learn Mind magic. Although those two magic schools have some offensive spells, together they give access to the best healing, protection and utility spells around. Not all Brothers elect to serve their faith through magic, however, and the class can equally hold its ground in melee combat. Brothers are the only class to have a 100% Unarmed skill modifier, and are as good with staves. The Monk and Martial Master specializations support this and give +20% and +40% to the Unarmed, Staves and Dodge skills. Depending on your playing style, you could thus elect to put a Brother on the front row as a fighting character when composing your party, and never bother training up his magic skills. Or do a mix of both, obviously. Druids are obviously the only magic-oriented class that can easily understand and control Nature Magic, which is their prime magic skill, but they can also very well wield Dark & Elemental magic. They are reclusive and mysterious characters, seldom wandering in cities. Their beliefs in the ancient gods and magics clash with the Order’s views: if you have a Druid and a Brother in your party, prepare for some arguing and dissention! By becoming an Elder or a Dark One, the Brother can further develop its Nature & Dark Magic skills, gaining access a peculiar spell set, strange to the other two classes, somewhere in the middle between offense and defense. Druids are also good with Staves and Missile weapons, and know how to use them to protect their woods. The Guardian / Wildwalker specializations can boost a Druid’s fighting skill modifiers as well as his Perception one, making him a deadly foe. Whatever the way you decide to build your character, a Druid is an interesting addition to any party. Legend of Grimrock 2 released! Georges Dimitrov on Back on track! maneus on Back on track! With Fire and Axe | DarkDale on Back on track!